SANTA ANA, Calif. – A jury found a criminal street gang member guilty today of murdering an innocent 51-year-old father of three. Eric Vasquez Ortiz, 27, Santa Ana, was found guilty of one felony count of second degree murder with a sentencing enhancement for participation in a criminal street gang. He faces a maximum sentence of 15 years to life in state prison at his sentencing on June 2, 2017, at 8:30 a.m. in Department C-43, Central Justice Center, Santa Ana. Co-defendant Sergio Avila Cabezas, 29, pleaded guilty on July 31, 2012, to one felony count each of voluntary manslaughter and participation in criminal street gang activity, with a sentencing enhancement for criminal street gang activity. Cabezas was sentenced to six years in state prison on Jan. 24, 2014. Victor Jesus Lagunas, 28, was found guilty by a jury in Case # 06CF3829 on Nov. 29, 2007, of one felony count of first degree murder and one felony count of participation in criminal street gang activity, and sentencing enhancements for gang member vicarious discharge of a firearm causing great bodily injury and criminal street gang activity were found true. 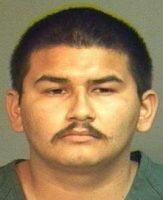 On Jan. 18, 2008, Lagunas was sentenced to 50 years to life in state prison. At approximately 7:25 p.m., on Oct. 23, 2006, Ortiz, a member of a criminal street gang with a moniker of “Termite,” was hanging out in his gang territory near Shelton Street and Highland Street in Santa Ana. Lagunas, with a moniker of “Dopey,” and Cabezas, with a moniker of “Pollo,” were in a gang that was friendly with Ortiz’s gang. Cabezas and Lagunas were together in Cabezas’ 2005 Black Toyota Camry in the area of Shelton Street and Wilshire Avenue in Santa Ana. They were armed with a .357 revolver and a 9mm semi-automatic handgun. Lagunas saw Ortiz and told Cabezas to pull over so he could talk to his “Homie” Ortiz. Cabezas pulled over and Ortiz got in the rear passenger seat. Ortiz, Cabezas, and Lagunas discussed hunting a particular rival gang and referred to it by using its derogatory nickname. The defendants drove east on West Wilshire through the intersection with South Shelton and saw 51-year-old Emeterio Adame standing next to the rival criminal street gang member Benjamin “Shotgun” Lopez, who is paralyzed from the waist down and was sitting in his wheelchair. Lopez was paralyzed when he was shot by rival gang members. Adame had just returned home from work and was talking to Lopez. Adame’s oldest son was a gang member who had recently been killed in a drive-by shooting. Emeterio Adame was never affiliated with any criminal street gang. At approximately 7:30 p.m., Cabezas stopped the vehicle a short distance away on Wilshire Avenue. Lagunas and Ortiz got out of the vehicle, and quickly ran to southeast corner of Shelton and Wilshire and opened fire. Lopez dove out of his wheelchair onto the ground and was unharmed. Adame was struck by a single bullet, which entered the right side of his back, lacerating his kidney and liver. Adame was pronounced dead as a result of the gunshot at 8:34 p.m at the Western Medical Center. Ortiz was interviewed by detectives from the Santa Ana Police Department (SAPD), who investigated this case, on Dec. 11, 2006, and claimed he was not involved in the shooting and was let out of the car before the shooting when he saw his girlfriend. Sufficient evidence to proceed against Ortiz was developed and Ortiz was then arrested on April 11, 2011. Ortiz again denied any involvement in the shooting and claimed he was let out of the car before the shooting to go look for friends from the friendly gang, which was inconsistent with his previous statement that he was let out when he saw his girlfriend. Co-defendant Cabezas agreed to testify against Ortiz after hearing that Ortiz had been discussing the case with another inmate. Both that inmate and Cabezas testified at the first trial, resulting in Ortiz being convicted for the murder of Emeterio Adame and the attempted murder of Benjamin Lopez. Senior Deputy District Attorney Dave Porter of the Gang Unit is prosecuting this case. After his 2014 conviction, Ortiz was facing a maximum sentence of life in state prison without the possibility of parole. On March 16, 2015, Ortiz filed a motion for a new trial. The Honorable Richard M. King postponed Ortiz’s sentence and granted the defendant a hearing for the motion that alleged that a jailhouse informant elicited statements from Ortiz, after the commencement of his criminal proceedings, in violation of his 6th Amendment right, known as a Massiah v. United States, 377 U.S. 201 (Massiah) violation. The defense alleged that the informant’s role as a governmental informant was wrongly concealed from the defense. Throughout the hearing, which started on Aug. 28, 2015, the Orange County District Attorney’s Office (OCDA) presented evidence that Ortiz was supplied with all the evidence that exists of any other informant work ever performed by the informant; the informant had supplied evidence only once before to a different agency in a totally different case and circumstance; there is no evidence that the OCDA was aware of suggesting the informant had any kind of understanding with or relationship with law enforcement to elicit statements; that the informant received very little consideration in exchange for his information in this case; and the small consideration that he did receive was disclosed to the defense prior to trial. Recent discovery of any jail records commonly referred to as TRED records contain no evidence that the informant was acting as a government informant in this case nor that the Orange County Sheriff’s Department (OCSD) or OCDA committed any misconduct. Rather, the TREDS supported the evidence presented at trial – 1) that the informant had only once before supplied law enforcement with information; and 2) that with respect to Ortiz the informant was simply a fellow inmate housed close to Ortiz who, acting on his own and not at the behest of law enforcement, talked to Ortiz about his case. The Court indicated that the pretrial evidentiary motion on this issue would limit the evidence to whether the informant was in fact a government agent. One witness, a retired SAPD Detective, testified that the informant contacted law enforcement on his own volition through his attorney and was not an informant but rather a witness to statements Ortiz made to him in custody. On Nov. 18, 2015, Judge King granted a new trial due to OCSD deputies invoking their 5th Amendment during the hearings on the motion, because the OCDA chose not to offer immunity to those deputies. No immunity was offered because the California Attorney General is investigating OCSD. Judge King did not find misconduct by the OCDA. Deputy District Attorney Seton Hunt handled the motion for a new trial.